To put that in perspective, that's 20% more than "Jurassic World's" pre-sales, which currently holds the record for the third highest-grossing film in history, behind "Titanic," according to Variety. "Disney has so many good things going on with Star Wars," Money Morning Technical Trading Specialist D.R. Barton told CNBC on Dec. 14. While Disney stock is receiving a lot of hype now, the excitement is justified. Disney is monetizing the Star Wars franchise in every way possible. And much of the hype will translate into outstanding box-office sales for Disney. 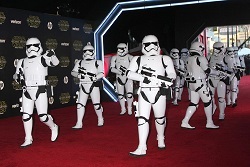 Morgan Stanley estimates "The Force Awakens" will generate $2 billion in ticket revenue. Rotten Tomatoes, a movie critic website notorious for tough reviews, gave the movie a 94% rating. With two more Star Wars movie installments on the way, Disney has the potential to build the Star Wars brand into something bigger than ever before. Ahhh…the opinion of 1 lone analyst making a stock price decline. Its interesting how 1 analyst can make a stock decline on his opinion, then put in order to "short" stock , with another order to buy said stock at his "low price target" to then sell when price recovers to higher price. Disney's list of movie content coming out until 2018 is published and if people did their own fact checking they would see the list of 35-40 movies that Disney will put out over the next 10 years is pretty good (including the Pixar, Marvel and Star Wars movies coming). Between ticket sales and merchandise I could see Disney making $50 billion over the next 10 years which leads to a market cap of $245 billion, over a return of 12.6% a year average for 10 years. Usually, these stock prices are based on the here and now..not what Disney's profitability will be 10 years from now. So, I find it interesting this analyst bases his "lower price target" on what he thinks Disney's profitability will be in 2017 (what he admits in other articles), which probably isn't accurate as a target anyways, because he did not consider the new content for 2016 and 2017 (8 new movies). Disney future movies: Cap'n America Civil War, Boba Fett movie, Han Solo movie, Frozen 2, Big Hero 7, Star Wars Rogue One, Iron Man 4, Indiana Jones 5 (5,6,7), The Finest Hours, Zootopia, new Jungle Book, Alice Through the Looking Glass, Finding Dory, Doctor Strange, Moana, The BFG, Cars 3, new Little Mermaid, Guardians of the Galaxy 2, Pirates of the Carribbean Dead Men Tell No Tales, new Beauty & Beast, marvel Spider Man, Thor: Ragnarok, new Duck Tales (tv), new Pete's Dragon, Coco, marvel Black Panther, Avengers Infinity War, Toy Story 4, Captain Marvel, Inhumans, Avengers Infinity War 2, The Invincibles 2, 4 new Disney princess cartoons, Ant Man 2, Star Wars 8, Star Wars 9. Well put. It's always smart to be skeptical of analyst ratings. Disney has a lot to offer over the next decade. It's unparalleled in its ability to build brands and expand franchises.